Light can be categorized into artificial vs natural light. These both possess their unique challenges and should each be considered in depth before moving forward with incorporating color into your home. 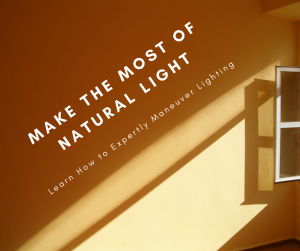 Lighting can be tricky and it takes lots of experience to understand how natural vs artificial lighting will adapt your color. Below you will find what you need to know about lighting when incorporating color into your home. Let’s start with artificial light. It is easier to incorporate because, for the most part, you can control it! From changing the wattage of the light bulb to moving lamps around, you can adapt artificial light to fit your design needs. Lighting creates atmosphere, drama, and intrigue in a room. One of the easiest ways to accomplish this is with a dimmer switch. Always use dimmers, even in the powder room! If dimmers aren’t an option, you can change the mood by having a variety of bulbs ranging from 40 to 100 watts. Use 75 to 100 watts in areas were you like to read to minimize eye strain. Another common form of artificial light is a lamp. Designers have been moving away from harsh overhead lighting for some time now, so when possible look for alternative lighting options such as table and floor lamps. Second, but just as important, is natural light. Have you ever noticed how your paint colors change throughout the day? What changes do you notice from the morning to the afternoon, to the evening? Take a look at the colors you want to incorporate into your home and take note of how volatile they are – how much does the look of each change given the amount of natural light? For example, when looking at using colors that highly vary based on the amount of natural light, paint them on a north-facing wall. Light from a north-facing wall will be more consistent throughout the day. The light from the window isn’t direct sunlight, rather it comes from the sunlit sky. This light will be cooler and have more blue hues. A north-facing room is a great choice to place an artist’s studio! Since light plays such an important role in choosing your paint colors you should consult with a professional Color Consultant before you pick up a paintbrush!